Minestra is an Italian word for soup, though not the only one. The word comes from the Latin verb minestrare, also the origin of the English verb “to minister;” it means “to take care of wants and needs.” Minestra is a comforting word. I once stayed in a drafty 18th century villa on a damp winter weekend. As a first course at dinner, my hostess served a simple soup of onions, carrots and potatoes, deliciously seasoned. As she ladled it into our bowls, she said, “I thought we needed a good minestra to combat the cold.” It was a comfort. A minestra is usually a light soup; minestrone, on the other hand, means “big soup.” Browsing through my Enciclopedia della Cucina Italiana, I find that most minestrone recipes have about fifteen ingredients. Traditionally, the ingredients should be seasonal, so that at this time of year, minestrone features pumpkin, broccoli and cabbage while in the summer, it has zucchini (zucchine in Italian) and peas. Here in the markets, some vegetable sellers cut up vegetable to make a minestrone mixture which you buy by weight. A couple of days ago, I saw one vendor chipping up radicchio to add to a tray already laden with cauliflower, carrots, onions, shelled beans, and more. There’s always a debate about the beans. Some people like them; others hate them. 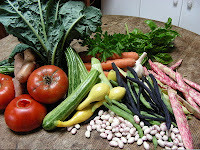 I hear people ask, “Do you put beans in your minestrone?” or “Do you have minestrone without beans?” I personally like it with beans, and I often add more if I buy from the market. 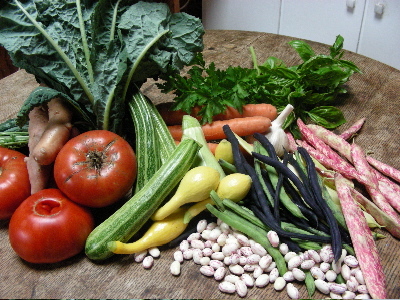 And buying from the market is a great way to get variety in your minestrone. Another real boon is frozen minestrone mix. I didn’t buy it for years because it seemed a bit ridiculous to buy a bunch of cut-up vegetables frozen together. I’ve since learned that it’s a great thing to have in the freezer. On a cold day when soup is in order, it’s wonderful to be able to pull out a package, add this and that from the vegetable crisper, a piece of sausage or pancetta, and some fresh herbs like bay leaf or thyme. The standard frozen food brand here is Buitoni. It’s classic ministrone package lists fifteen ingredients: potatoes, borlotti (a type of shelled beans), tomatoes, carrots, peas, zucchini, celery, swiss chard, pumpkin, green beans, cabbage, leeks, parsley, basil, and garlic. A winter and summer mix. 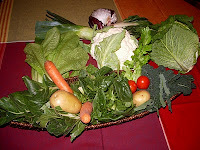 Recipes vary from region to region. In Liguria (Genoa), you’ll find lots of basil; in the northeast, sage. In the north, people add rice while central and southern Italians favor pasta. Some people may forgo both in favor of potatoes. There’s an old saying that if you ask one hundred French chefs to cook a traditional sauce, you get the same sauce one hundred times, but if you ask one hundred Italian chefs to cook a traditional sauce, you get one hundred different sauces. With minestrone, you get a different version with every cook. There’s simply nothing like it on a cold day. Ladle up a big bowl, sprinkle it with parmesan, pull off a chunk of crusty bread, and pour out a glass of red wine. A simple feast. My husband I toured Tuscany several years ago and fell in love with the place for its beauty and also its wine and food. What an informative and enticing blog you have here. It makes me hungry just reading about the soup. I really miss the markets in Italy and look forward to going back someday. Your post took me there if only for a short time. I'm so glad you enjoy it. I hope you'll drop by often, and please leave a comment if you are moved to do so. You might like to know that I also blog about Italy on alternate Thursdays on Novel Adventurers http://NovelAdventurers.blogspot.com This week I'll be blogging about why Italians love anchovies. 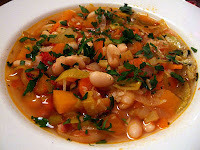 I love minestrone even though I've never been to Italy to sample the real deal. It's that lovely combination of vegetables and beans that really appeals to me. Does the "big soup" name refer to the many ingredients or is it a heartier soup compared to a regular minestra? I think it's both. It's certainly a thick soup that you can spoon up in heaps, but of course it does have lots of ingredients. That's why I really like having the two sources, fresh and frozen, to rely on. When I was a child, my mother used to can soup mixture, a blend of tomatoes, corn, okra, and perhaps beans. Then at soup making time, she would add carrots, potatoes, other vegetables on hand, and perhaps meat. So the tradition is not new to me.